Galeazzo Maria Sforza (24 January 1444 – assassinated, 26 December 1476) was the fifth Duke of Milan from 1466 until his death. He was famous for being lustful, cruel and tyrannical. He was born to Francesco Sforza, a popular condottiero and ally of Cosimo de' Medici who would gain the Duchy of Milan in 1450, and Bianca Maria Visconti. He married into the Gonzaga family; on the death of his first wife Dorotea Gonzaga, he married Bona of Savoy. 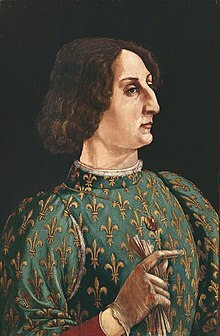 Galeazzo Maria Sforza was born in Fermo, near the family's castle of Girifalco, the first son of Francesco Sforza and Bianca Maria Visconti. At the death of his father (8 March 1466), Galeazzo was in France at the head of a military expedition to help King Louis XI of France against Charles I of Burgundy. Called back home by his mother, Galeazzo returned to Italy by an adventurous trip under a false name. The false identity was necessary as he had to pass by the territories of the family enemy, the Duke of Savoy, who made an unsuccessful attempt on Galeazzo's life. He entered Milan on 20 March, acclaimed by the populace. In his first years Galeazzo and his mother ruled jointly, but later his ruthless character pushed him to oust Bianca Maria from Milan. Sforza was famous as a patron of music. Under his direction, financial backing and encouragement, his chapel grew into one of the most famous and historically significant musical ensembles in Europe. Composers from the north, especially the Franco-Flemish composers from the present-day Low Countries, came to sing in his chapel and write masses, motets and secular music for him. Some of the figures associated with the Sforza chapel include Alexander Agricola, Johannes Martini, Loyset Compère, and Gaspar van Weerbeke. However, most of the singers at the Sforza chapel fled after Galeazzo's murder and took positions elsewhere; as a result, there was soon a rise in musical standards in other cities such as Ferrara. Galeazzo Sforza is also known to have had a cruel streak. He was a notorious womanizer who often passed his women on to his courtiers once he was tired of them. Sforza once had a poacher executed by forcing him to swallow an entire hare (with fur intact), and had another man nailed alive to his coffin. He also had a priest who predicted a short reign for Sforza punished by being starved to death. This made him many enemies in Milan. 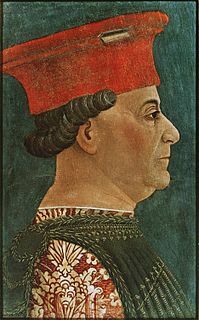 It was also said of Galeazzo Sforza that he had raped the wives and daughters of numerous Milanese nobles, that he took sadistic pleasure in devising tortures for men who had offended him, and that he enjoyed pulling apart the limbs of his enemies with his own hands. Lament of the duke Galeazzo Maria (1476). There were three principal assassins involved in Sforza's death: Carlo Visconti, Gerolamo Olgiati and Giovanni Andrea Lampugnani, all fairly high-ranking officials at the Milanese court. Lampugnani, descended from Milanese nobility, is recognized as the leader of the conspiracy. His motives were based primarily on a land dispute, in which Galeazzo had failed to intervene in a matter which saw the Lampugnani family lose considerable properties. Visconti and Olgiati also bore the duke enmity - Olgiati was a Republican idealist, whereas Visconti believed Sforza to have taken his sister's virginity. After carefully studying Sforza's movements, the conspirators made their move on the day after Christmas, 1476, the official day of Santo Stefano, the namesake of the church where the deed was to be committed. Supported by about thirty friends, the three men waited in the church for the duke to arrive for mass. When Galeazzo Sforza arrived, Lampugnani knelt before him; after some words were exchanged, Lampugnani rose suddenly and stabbed Sforza in the groin and breast. Olgiati and Visconti soon joined in, as did a servant of Lampugnani's. Sforza was dead within a matter of seconds. All the assassins quickly escaped in the ensuing mayhem save for Lampugnani, who became entangled in some of the church's cloth and was killed by a guard. His body soon fell into the hands of a mob, which dragged the corpse through the streets, slashing and beating at it; finally, they hung the body upside-down outside Lampugnani's house. The beheaded corpse was cut down the next day and, in an act of symbolism, the "sinning" right hand was removed, burnt and put on display. Despite the initial public reaction, the government brought swift justice, soon encouraged by the public as well. The conspirators had given little thought to the repercussions of their crime, and were apprehended within days. Visconti and Olgiati were soon found and executed, as was the servant of Lampugnani who had participated in the slaying. The executions took place in a public ceremony that culminated in the display of their corpses as a warning to others. Evidence from the conspirators' confessions indicated that the assassins had been encouraged by the humanist Cola Montano, who had left Milan some months before, and who bore malice against the duke for a public whipping some years before. While being tortured, Olgiati also uttered the famous words, "Mors acerba, fama perpetua, stabit vetus memoria facti" (Death is bitter, but glory is eternal, the memory of my deed will endure). Similar elements indicate that this assassination was likely influential in the Pazzi Conspiracy, a subsequent attempt to dethrone the Medici family in Florence and to replace them with Girolamo Riario. ^ Tobias Daniels, Umanesimo, congiure e propaganda politica. Cola Montano e l’Oratio ad Lucenses, Rome 2015 (RR inedita 63. saggi). ^ a b Ettlinger, Helen S. (1994). "Visibilis et Invisibilis: The Mistress in Italian Renaissance Court Society". Renaissance Quarterly. 47 (4): 770–792. doi:10.2307/2863216. JSTOR 2863216. ^ "Archivio capitolare della basilica concattedrale di Sezze". www.archiviosezze.it. Retrieved 2017-12-11. The House of Riario, sometimes referred to as Riario-Sforza is an Italian noble family from Savona, near Genoa. Closely associated with the Papal States, the family gained control over several signorie ("lordships"), such as Bologna and Forlì. Girolamo Riario was Lord of Imola and Forlì. He served as Captain General of the Church under his uncle Pope Sixtus IV. He took part in the 1478 Pazzi Conspiracy against the Medici, and was assassinated 10 years later by members of the Forlivese Orsi family. Zanetto Bugatto, also known as Zanetto Bugatti, was one of the most well documented court portraitists of the 1400s. A key painter of the Lombardy region, Bugatto worked for 15 years for the first two Sforza Dukes of Milan, particularly Duke Galeazzo Maria Sforza and his Duchess Bona of Savoy. His work was influenced by artists such as Rogier van der Weyden, Andrea Mantegna, and Jean Fouquet, all of whom he met during his travels. Bugatto’s work was described by Galeazzo’s ambassador Leonardo Botta as being similar to Sicilian painter Antonello da Messina. It is not clear whether Bugatto painted works other than portraits which he typically made on panel and in fresco. He is notable for being one of the first Italian artists, along with Antonello da Messina, to focus on portraiture in the Netherlandish style to such an exclusive extent. Bianca Riario was an Italian noble and regent, Marchioness of San Secondo by marriage to Troilo I de' Rossi, and regent of the marquisate and county of San Secondo for her son Pier Maria during his minority between 1521 and 1522. She was the eldest child and only daughter of Caterina Sforza by the latter's first husband, Girolamo Riario, a nephew of Pope Sixtus IV.